Review: Elvis & Nixon / It's Just Movies Review: "Elvis & Nixon"
“Elvis & Nixon,” Liza Johnson’s narrative fiction retelling of the White House meeting between Elvis Presley and President Richard Nixon, packs the most entertainment per ounce of any film this year. This is an exploration into what did happen, and what might have happened, during a meeting of the two most opposite people one could imagine. As Elvis put it, “When people see me, they see their first kiss, or their first love, with my song playing in the background.” When people saw R. M. Nixon, they saw a conservative Republican imprisoning students and lording over a carpet bombing program. As the film explains it, and history verifies, Nixon recorded virtually everything that occurred in the Oval Office. He did this because he wanted everything to be saved for his museum to better reflect his achievements. In the end, these recordings would play a big part in the Watergate investigation and his subsequent resignation. So it appears the recordings of the Elvis-Nixon meeting are the real thing. Totally amazing. The film has two parts, the convolutions and whacky inspirations that drove the King to virtually force the meeting on the president, and the meeting itself. Starting off as strictly a five minute public relations stunt, the meeting expanded to hours of looney social-political wanderings and unmoored hilarity. Kevin Spacey playing Nixon is funny enough, but by and large Spacey just does his job. His work is more of an impersonation than acting. 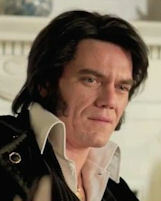 Michael Shannon as Elvis is another thing entirely. Shannon uncorks the most surprising and hypnotically fascinating look inside the legend one could imagine. He abandons his stone-faced moodiness of “Boardwalk Empire” and “Midnight Special” and interprets the declining mental state of Presley with extraordinary clarity. The titular meeting took place in December 1970 — not an overly exciting time for Nixon (although Watergate was brewing), it was the beginning of the end for Elvis. His relationship with his wife Priscilla was on the rocks, he would barely see her in 1971. Although he had engineered an astounding comeback he bore the scars of the British Invasion. He developed bizarre conspiracy theories to explain why the world had moved on without him. Shannon is able to portray a famous and powerful man who is fighting hard but losing his place as a world leader. Elvis was getting smarter, as aging people do, but every day brought an increasing awareness that nobody really knew him as a person. He had few friends and the film emphasizes his relationship with Larry Shilling (Alex Pettyfer), who was instrumental in getting Nixon to see Elvis. As the film shows it, Shilling was one of the few people in whom Elvis could confide. In the end, even Larry leaves him to get married and pursue a more normal life. A charming story of a precious moment in history, “Elvis & Nixon” is also a troubling inside look at one of the all-time greatest American performers and the tragedy his art held in store.